Wow, a small brunette. How surprising. Daughter of Leia Organa and Han Solo, Jaina Solo is a Jedi student of Luke Skywalker. Like her father, she is also a crack pilot and skilled mechanic. Like her mother, she is a born leader. Like her uncle, she briefly turned to the dark side. Like her grandfather, she hates sand. Like her other uncle, she has a surprising amount of body hair. Like her babysitter, it's against her programming to impersonate a deity. Like her godfather, she prays the deal is not altered further. Like her great-uncle, she wants those two droids cleaned up before dinner. Like her father-in-law, she looks good in black. Like her grandma, she owns more than one set of clothes. Like her brother, she has a twin sibling. Like her aunt, she was erased from continuity. 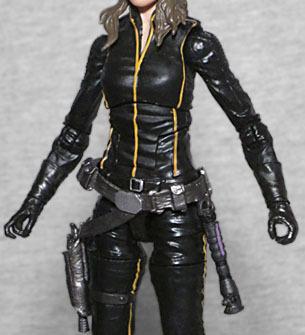 There was already one Jaina Solo figure, but that was eight years ago and in a different scale. That one showed Jaina when she was still barely a woman, still wearing her Jedi robes; for this one, she's an adult, and wearing her pilot's uniform. At a glance, she looks like an Imperial TIE Pilot, because she's wearing all black (unlike Kotobukiya's Bishoujo statue, which portrayed her in a more traditional blaze orange), but then you notice the Rebel symbols on her helmet and you learn she flies a specical stealth X-Wing, and it all makes more sense. Her harness is a separate piece fit over the toy's body, meaning you can remove it if you just want to display her in her jumpsuit - clearly Hasbro had that in mind, because why else would they bother painting the little yellow stripes underneath it? Jaina has never been portrayed by a real person, but a lot of the art seems to favor Carrie Fisher's facial features over Harrion Ford's. This toy brings a little parity, at least, because this version looks more like her dad than her mom - like someone ran Dr. Richard Kimble through FaceApp. The strongest parallel is the mouth, which duplicates that familiar smirk perfectly. The articulation is as good as The Black Series typically delivers: balljointed head, hinged neck, swivel/hinge shoulders, elbows and wrists, balljointed torso, an extra hinge below that, balljointed hips, swivel thighs, double-hinged knees, and swivel/hinge ankles. She is wearing heels, so her feet kind of "twist" more than rocking side-to-side, but at least she doesn't share Jyn Erso's weird neck issue. The other Jaina toy was released before Hasbro had to back-slide into doing minimally articulated figures, but a 3¾" action figure from 2010 can't hope to compete with a 6" action figure from 2018 when it comes to movement. 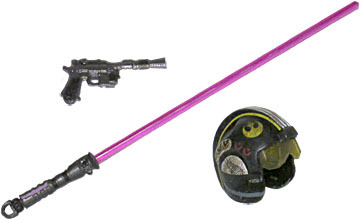 Jaina has three accessories: a helmet, a blaster, and a lightsaber. 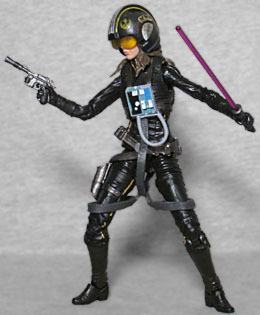 The blaster fits in the holster on her right hip, while the lightsaber can hang on her left hip (if you remove the purple blade). The helmet is the same style the Rebel pilots used to wear, with a ridge over the top and a clear visor over the eyes. It's the same black as her suit, with golden Rebel symbols on the front and various tally marks on the sides. It fits on her head really well, even with her long hair. Jaina Solo was the winner of a 2016 fan vote to pick which character would be added to The Black Series. Since it's now 2018, you can see that the wheels of progress turn slowly. But now we've got her, and she's good. Of course, the hardest thing will be finding her at all - she's yet another member of the "barely available in stores" club.